﻿ What is hedging mode and how to use it in trading? For traders News and features Features What is hedging mode and how to use it in trading? Have you ever wanted to have two positions open on the same market, at the same time – but in opposite directions? Perhaps you have the view that the market is going to experience a large move, but you are not sure in which direction. Or maybe you have an open position on a market and want to temporary lock in your current profit or loss without closing the position entirely? As a Capital.com client we are pleased to let you know that you can now do this. 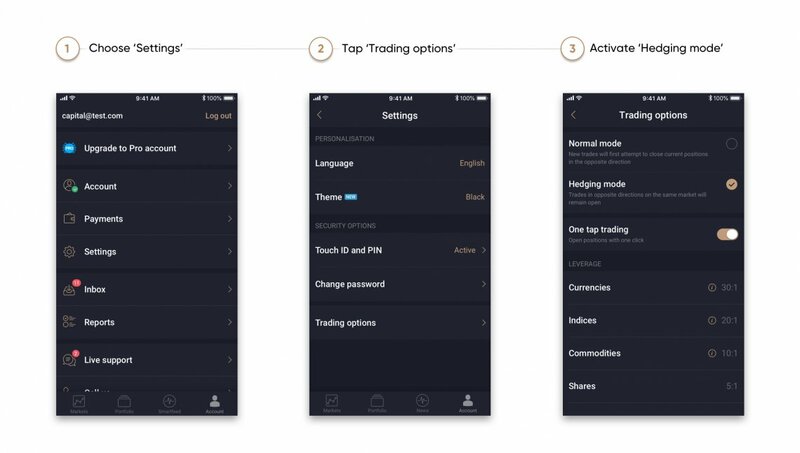 Based on feedback from our traders we have introduced “hedging mode” into our platform. If you have an open position on a particular market you can now open up a new trade on that market, in the opposite direction, without closing your existing open position. Let’s say you are long (so have bought) 10,000 GBP/USD using contracts for difference (CFDs) and have a profit of $10. The market is currently trading at 1.2800 to sell. You think the market may experience a slight sell-off from here, but you still think that in the medium term GBP/USD will move higher. By using hedging mode you could, for example, sell 10,000 GBP/USD, again using CFDs, at 1.2800. You would now have two open positions in this market – one long and one short. These can be closed independently of each other. If the market were to drop, then of course the short would make money and the long would lose money – and vice versa if the market were to rise. Some traders use this approach believing it helps them time the various short term swings in a market. It’s important to understand that this approach is not without its drawbacks. The main problem here is that if you are long 10,000 and short 10,000 at the same time, as in the above example, then your net position is effectively zero. If the market goes up then the long makes money but the short loses money. By using the hedging mode you have locked in the profit or loss at the time you open up the opposing position. Some people would rather wait for a clearer direction from the market before opening up just one single position. Plus of course you have paid the bid/offer spread on both positions. Keep in mind, trading is risky.